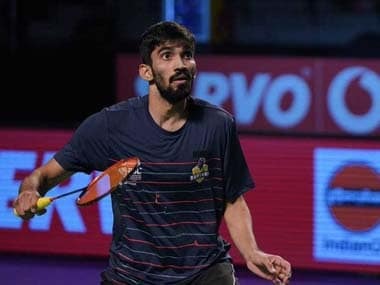 Hyderabad: The mixed doubles duo of Satwiksairaj Rankireddy and N Sikki Reddy and Malaysian Daren Liew defeated their more experienced opponents to help Ahmedabad Smash Masters beat Delhi Dashers in the Premier Badminton League on Wednesday. The Smash Masters, who had started their fourth season campaign with a convincing 4-1 win over North Eastern Warriors, continued from where they left in Mumbai to win their opening two matches before their skipper Viktor Axelsen suffered a reversal. However, Kristy Gilmour came back after losing the opening game to beat Evgeniya Kosetskaya 12-15, 15-12, 15-7 to inflict second straight loss on Delhi Dashers. Gilmour looked completely out of sorts till the midway stage of the second game when she suffered a fall while trying to return a sliced drop from Kosetskaya. While she took time to get up and return to court, it seemed the break allowed her to rework her game plan and then it was no stopping the CWG medallist Scottish women's singles player. She adopted an aggressive approach and hardly allowed her opponent to build any rallies to clinch two points for the trump match and also the tie. 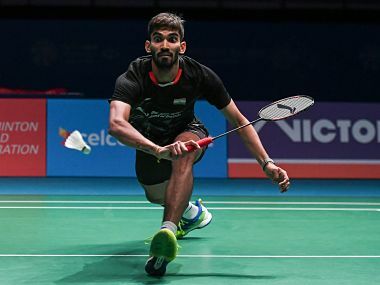 Earlier, Satwik and Sikki, who train at the Gopichand Badminton Academy in Hyderabad, put their team on the road to victory when they got the better of Jongjit Maneepong and Lee Chia Hsin 15-11, 15-10. The all-Indian combination was clearly in control throughout the encounter with Sikki dominating the net exchanges while Satwik scoring valuable points with his trademark smashes. Liew then put spanners in Delhi Dashers plans as he came up with a scintillating performance to defeat the opponent's trump, HS Prannoy. The Malaysian was strong in defense and time and again caught Prannoy on the wrong foot with his backhand flicks and cross court smashes. It was only in the second game that Prannoy looked like fighting back as he opened up a 8-6 lead before Liew bagged five straight points to regain the advantage and though the Indian managed to save three match points, yet another error on the smash gave the Smash Masters a 2-(-1) lead. However, Tommy Sugiarto kept the Dashers in the hunt when he upset former world champion Axelsen in the second men's singles match. The Indonesian was looking at sea in the first half of the opening game against the Danish former world number one but slowly but surely grew in the match. He turned things around by keeping the shuttle in play for long to win the opening game. Axelsen came back strong in the second to force a decider but lost momentum early in the game and was trailing 2-8 at the change of sides. Sugiarto then ensured that there were no more hiccups as he sealed the match 15-12, 10-15, 15-8.